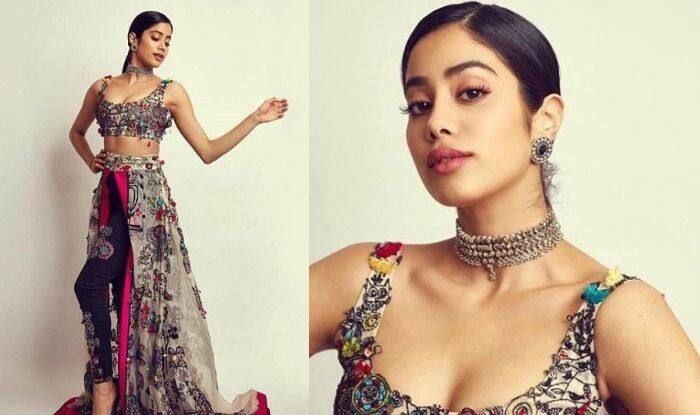 Janhvi Kapoor has just entered the Bollywood industry and is already winning hearts with her beauty and sense of fashion. She has also made an appearance as the cover girl in quite a number of leading fashion magazines. Janhvi, who keeps experimenting with her outfits just like her older sister Sonam Kapoor recently donned a gorgeous tribal inspired outfit by Anamika Khanna at the 25th edition of SOL Lions’ Gold Awards. With subtle makeup, hair tied in a perfectly neat ponytail and heavy jewelleries, Janhvi looked drop-dead-gorgeous as always. The way Janhvi carries herself is just incredible. The Dhadak actor looks stunning even when she steps outside the house sporting just a basic t-shirt and jeans. At the award show, she even won the best debutant for her film Dhadak where she was seen opposite Ishaan Khatter. Post that, rumours have been doing the rounds that Janhvi and Ishaan are dating. Though the two slammed all rumours and said that they are not seeing each other, speculations are still rife that they are. Janhvi made her big Bollywood debut with Dhadak with Ishaan. Though the film got mixed reviews from the audience, her performance was praised by many. Her fans are now eagerly waiting to see her in her next film. Talking about her fashion game, the young actor has always left the fashion police impressed with her incredible dressing sense. Seems like she is following her older sister Sonam’s footsteps when it comes to fashion.